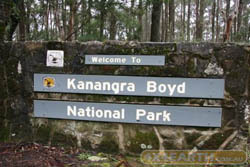 After leaving Jenolan Caves head towards Kanagra Walls, turn left into dirty track, there will be a sign identifying where you are. Anyway... the trip towards Kanagra Walls is easy, as a matter of fact we saw standard Subarus and other smaller SUVs at the end of the track. The view of the Walls is breath taking. There is also a walk down the gorge and access to a beautiful Water falls which, once again is breath taking. BE WARNED IT GET VERY COLD DURING THE WINTER MONTHS! Heading back out of Kanagra Walls heading back along the track there are a few tracks on the left hand side, take those and it will take you down the Kowung River. You will need a vehilce that has both high and low range, especailly if it has been raining or wet. The muddy track can cause you to slip and without low range you might not have the grip required, especially coming up from the river. Approaching the river it becomes steep, once again, if it has been raining or the track is wet, low range is required, I found this very useful with my 80 Landcruiser. This is also confirmed with my companion with his 91 Nissan Patrol. You can cross the river in the dry period, however, crossing it during wet period or short after wet periods is not recommended unless your vehicle is lifted and you feel that your vehicle is capable of such crossing.